Action movies are often criticised for being stupid. They are looked down upon by critics and blamed by social commentators for causing the perceived anti-intellectualism of today's youth. While there are many examples of this genre, or indeed any genre that would fit the bill, action movies are capable of being just as intelligent or insightful as their more artistic counterparts. Gojira is a classic case in point, retaining its relative intelligence in spite of its dramatic creakiness. The cultural influence that Gojira exerts is undeniable. Apart from generating a legion of sequels, crossover films and one god-awful American remake, it has become one of the most iconic Japanese artistic creations. But aside from its cemented status as a symbol of Western perceptions of Japan, its influence on cinema worldwide is just as marked. As well as directly inspiring works like Cloverfield and The Host, its imagery has influenced everyone from Matt Groening to Steven Spielberg, who dubbed the monster's death scream onto the end of Duel. 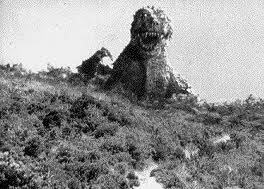 For better or worse, Gojira either created or cemented many of the conventions of the modern monster movie. The groundwork may have been laid by King Kong and The Creature from the Black Lagoon, but the conventions founded in Gojira are now so endemic that they deserve recognition. We have the central romance between two people who are destined to be together, set against the backdrop of their home being destroyed or, as with Jurassic Park, other people they care about being put in mortal danger. While most of the characters want to destroy the monster, one person wants to keep it alive to see what they can learn for it (a variation of King Kong, in which one character wants to make money from it). And there is a distant or geeky scientist who doesn't want to help, but ends up possessing the only thing that can stop the monster. Like many classic foreign-language films, Gojira had a rough time with the American distributors. 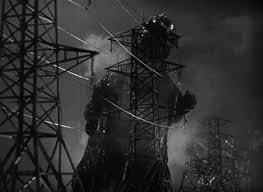 Just as Metropolis was heavily butchered to reduce its running time, so Gojira was taken apart and restructured in such a way that the American version looked like a totally different film. This version, called Godzilla, King of the Monsters!, was dubbed into English with new footage of Raymond Burr playing a reporter called Steve Martin - which leaves everybody free to remark that the American version is a complete joke. The disrespect which Terry Morse showed for the original is plain to see: even with the reams of new footage, the new version was 10 minutes shorter than the original. Ironically, one of the big problems with Gojira is something which is characteristic of American action movies, particularly with more contemporary offerings. Like many recent CG-heavy action films, Gojira does end up being dominated by its special effects. Some of the set-pieces are incredible even now, such as the central 10-minute sequence of the monster breathing fire and laying waste to Tokyo. But like the American remake, the extent to which the set-pieces are emphasised prompts questions about the workings of the monster - chief amongst them being, why would it help a lizard to be fire-breathing if it lived underwater? 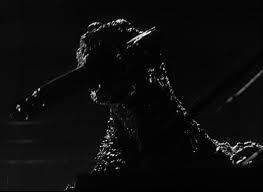 This dominance of effects is solidified by Gojira's melodramatic plot. It's wrong to attack one of the definitive monster movies for falling into the clichés it created, just as it's wrong to criticise The Cabinet of Dr. Caligari for having a twist ending. But you can still see all the plot points coming a mile off, and the characters are so clearly drawn from a visual point of view that you don't really have to second-guess. 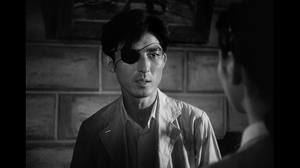 The moment you see the character with a scar and an eye-patch, you know there is something shifty about him. There is some dispute in critical circles over how good or original Gojira's effects are. Roger Ebert, who called it "a bad film, but with an undeniable urgency", argued that the effects in King Kong were much more state-of-the-art, describing Godzilla the monster as "awkward" and "crude". It's an argument that has never been properly settled, not even when the two monsters went head to head in King Kong vs. Godzilla eight years after this. In the end, the only way to judge the validity of Gojira's effects is whether or not they succeed in giving the monster character. This is not simply a case of whether or not he/ she/ it looks like a man in a beanbag wandering around on a set; it is whether the physical form taken by Godzilla/Gojira conveys or achieves the desired emotional response. The short answer to this is yes, because we do believe that the monster has intelligence and a personality. We aren't necessarily in floods of tears when the oxygen destroyer kills him, but there is still the feeling that something physical and tangible has departed, something in which we invested and believed. 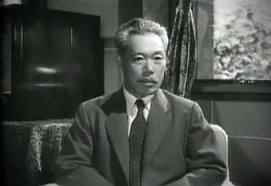 Where Gojira differs from, and perhaps improves on King Kong is its political subtext. The film is an engrossing allegory for Japan's reaction to the events of Hiroshima and Nagasaki, and to the on-going US nuclear tests occurring in the Pacific. This was something which was not widely reported in the American press at the time, which coupled with political pressure might explain why the US version cut out most of the subtext. 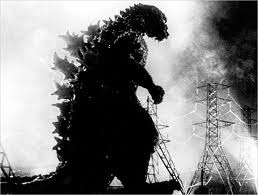 The parallels Gojira draws between real-life events and those of the characters would have been strikingly clear at the time, and are arguably more so to us nearly 60 years later. 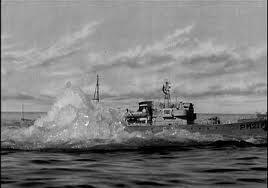 The underwater explosions which are reported when the first ships sink are an echo of the after-effects of Bikini Atoll: the Americans exploded a device two-and-a-half times larger than expected, leaving hundreds of people within the supposed safety zone with acute radiation poisoning. The harrowing shots showing the aftermath of Gojira's destruction of Tokyo could be lifted straight from The World at War. Considering that Japan was still recovering from the long-term effects of the war, including these kinds of scenes was decidedly brave. There is also a direct parallel between the real-life and fictitious characters. 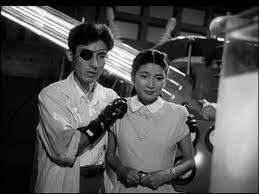 Dr. Daisuke Serizawa, played by Akihiko Hirata, is a convincing reflection of Professor Robert Oppenheimer, one of the chief scientists at the Manhattan Project which created the first bombs. 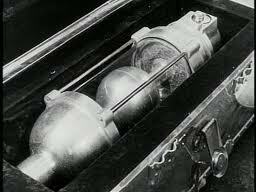 When we are taken inside his lab, there is a mention of his "German friends", a sly nod to the fact that German and Austrian scientists pioneered many of the components of the atomic bomb. Serizawa refuses to use the device because he knows how devastating it can be on a small scale, a possible nod to Oppenheimer's mixed feelings following the Trinity test. While Oppenheimer remarked that he had "become death, a destroyer of worlds", Serizawa dies alongside his invention, lest it ever be used again. 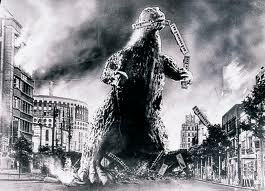 Gojira, like King Kong before it, uses the monster to physicalize a deep-rooted or pertinent fear within humanity. It explores the fears surrounding nuclear war, or more general fears about a seemingly unbeatable weapon. Gojira is characterised as an ancient monster, somewhere between Jules Verne and H. P. Lovecraft, rudely awakened from its long slumber by the nuclear tests. It is simultaneously a symbol of nuclear war itself, the unforeseen consequences or fallout (in both senses), and a physicalisation of the dark, self-preserving aggression at the heart of every human being. It is rare that you get a monster movie, then or now, with such thoroughly intelligent subtext. But the film does have a couple of dramatic shortcomings which hamper its ability to convey these ideas. 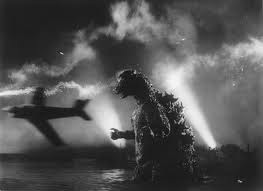 Because the film is constructed like a melodrama, complete with screaming heroines and muscular heroes, there isn't much in the way of tension in the scenes between Gojira's attacks. Whereas The War of the Worlds had moments of real threat, where it seemed like the aliens would win, Gojira always has a feeling of certainty about its outcome which is only partially mitigated by the old man's warnings at the end. Character development is in rather short supply, something which even Akira Ifukube's great soundtrack can't make up for. 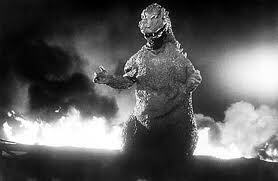 Considering its budget and the development of special effects, Gojira holds up surprisingly well. It is more thought-provoking and emotionally involving than The War of the Worlds, if nothing else because it holds its nerve and gets the ending right. Its dramatic shortcomings are more or less made up for by the emotional impact of the more harrowing scenes, and the monster itself is pretty convincing. As a film in and of itself it's flawed and ropey in places, and while it can't hold a candle to King Kong (in either version), it is essential viewing.